I’m on the left at 35 weeks. I’ve been feeling great! I really have no complaints so far in the third trimester. My blood pressure is on the high side, but not high enough to be of concern. My last two urine tests were “gold star” worthy, says my midwife. My iron has stayed at a steady 11. I’m still drinking my 1 quart of Red Raspberry Leaf Tea and taking my fermented cod liver oil every day. So far, no Braxton Hicks. God continues to bless me with great health and I am so thankful! These days are filled with getting the remaining baby items needed. I was surprised with two baby showers, which helped us tremendously. Thank you everyone who gave gifts! Then with the gifts cards we were able to get our car seat for free! We feel so blessed!… and excited now that we have all this baby stuff sitting around. I purchased the remaining items on my amazon registry this week, which totaled a number that made me gulp before I hit the checkout button. BUT, I need to keep reminding myself that it paid for all of the cloth diapers we will need for this baby and perhaps following ones. 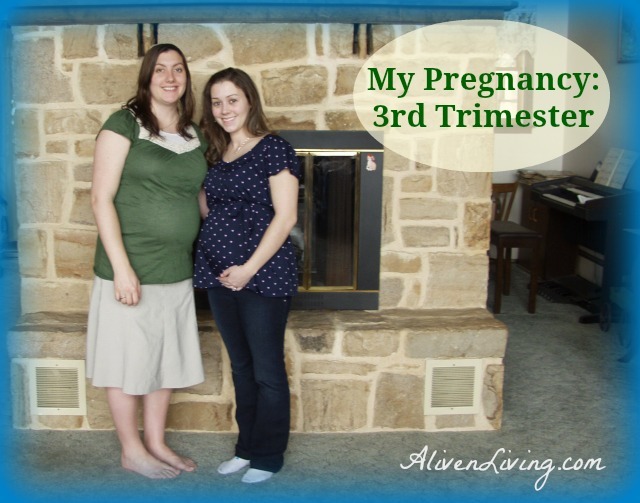 This week started out very different from the rest in my third trimester. Saturday, we went out for lunch and I ended up getting heartburn when I laid down to go to sleep that night. I awoke around midnight and drank some kombucha (a vinegar-like drink). In the past this has relieved my heartburn in five minutes and I can sleep the rest of the night. This time, it help right away, but I woke up again with heartburn in two hours. So, I drank some more and on continued this cycle of waking up every two hours. Until the alarm went off. The next night I slept very good with no heartburn! Yay! Monday around 4:30 p.m. I felt like I needed a nap. I haven’t taken naps during my pregnancy since the first month! This happened again on Tuesday and Wednesday, and I just happened to read in one of my baby books that it is caused by the production of the hormone oxytocin and could mean that I will have an easy birth. That’s cool with me! You may find that you feel a little different after your baby has dropped. Some pregnancy complaints may get worse, while others may improve. On the one hand, your baby will be taking up more room in your pelvis, so you’ll probably find that you have to urinate even more often than before. You may get an uncomfortable feeling of pressure deep in your pelvis, feel increasing discomfort when you walk, and even begin to waddle a bit. On the other hand, with less pressure on your stomach, you’ll be able to eat a little more without feeling uncomfortably full, and if you’ve been suffering from heartburn, you may get some relief. You’ll probably find that breathing feels easier, too. Haha… am I really starting to waddle? lol. It seems as if I am hungry all the time now! Anyways, my midwives suggested to me today that I may be farther along than I think since the baby has dropped already. I guess we will find out soon! When Did Your Baby Drop During Your First Pregnancy? I just finished my 1st trimester and even though I am couple of weeks away from my baby drop, it is pretty interesting to hear different views on it. It seems that the relief aspect is the one I am looking forward to,but the waddling and even more urination NOT lol.